We'll return to The Quints' Christmas on Monday. 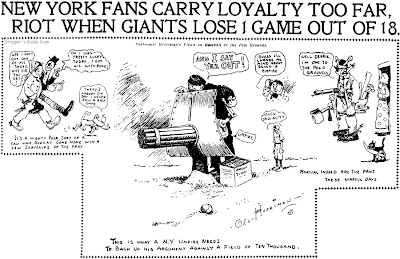 Thursday, May 23 1907 -- The Examiner asks the question, "Which is the rowdier bunch -- McGraw's brawling New York Giants ball team or their fans?". It was becoming commonplace in this wild year for the Polo Grounds fans to assault umpires and stage riots on the slightest provocation. Sunday, May 28 1907 -- Australian boxing champ Bill Squires has arrived in America looking to be the fighter who finally coaxes Jim Jeffries out of retirement. Failing that Squires will settle for current champ Tommy Burns. If you'd like a preview of the results of that matchup before Herriman reports on them, see Squires' bio here on Boxrec. A Christmas Present For You: I just received an offer from newspaperarchive.com that I can give up to three people one-month free subscriptions to their service. First three people that request it get them. Just send me your name and email address, either as a comment here or privately to stripper@rtsco.com. EDIT - Sorry, all the gift subs have been spoken for! Beginning today we're running the 1940 King Features Christmas story strip The Quints' Christmas. The title children are the famous Dionne Quintuplets, the first quints to survive infancy. The Dionnes were world famous at the time, and sadly were exploited unmercifully by their caretakers to make a fortune off their fame. You can read their sad story here on Wiki. The strip was written by Brandon Walsh who handled the scripts for at least four of King's Christmas stories in addition to his regular writing duties on Little Annie Rooney. This 1940 Christmas strip would be his last and bears some marks of being a rush job. The first couple weeks of strips read as if there are parts of the narrative missing or out of order, and the story sort of oozes around aimlessly in a haze, almost like what you might expect a comic strip would read like if it was written by William S. Burroughs. Near the end it evolves into a truly bizarre anti-war message. Walsh was obviously deeply affected by the war raging in Europe, especially the merciless air bombing of England, but his attempt to weave this allegorically into his Christmas story -- well, I'll let you see how it plays out. Art was provided by Royal King Cole, another regular on the King Christmas strips. He, too, would make 1940 his last year on this seasonal task. I hope you enjoy this year's Christmas strip offering from Stripper's Guide. While it's no holiday classic, it's definitely worth a read for its unique strangeness. Enjoy! Good summation. This is pretty dreadful, even for the era. Serious continuity issues, and that's before we get into the silly insipid pointless story. Never had a chance. Poor kids. I heard about this not all that long ago and was stunned that it was not in all the history books. I mean, c'mon, Charles Addams! But, unbelievably, I guess it wasn't all that popular. I did find it in the Pasadena (Ca.) Independent on June 17, and July 1, 1956, both on the Editorial page (pg A2) and both on a Sunday. Also on Monday January 2, 1956 it ran, also on the editorial page, in the San Antonio Express (pg 4A). The Express deleted all the copyright notices. Good job finding those Addams samples DD. I did a few searches for this series and that crappy newspaperarchive search kept ignoring everything but the word 'world' and giving me thousands of hits. What's your secret? I'll put together a goodie package for you. Already have your address. Oddballs / John Kuchera. -- Rochester, N.Y. : Kuchera, 1985. 'a' upside-down, and 's' reversed. 1. Balls (Sporting goods)--Comic books, strips, etc. 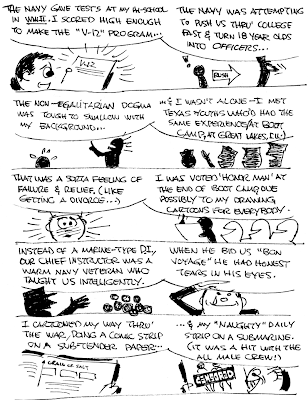 I.
Davy Associates has introduced "Dude," a weekly comic starring a young office worker. It's by Herb Stansbury, who also draws "Offline" for the San Clemente, Calif.-based syndicate. 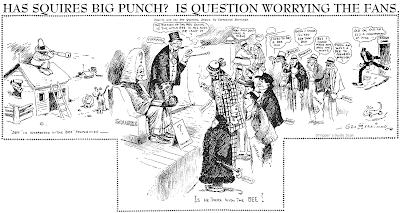 Other features being offered by Davy include the topical "Topics" cartoon by Harley Schwadron and a weekly crossword puzzle by Charles Preston. I wonder if this was seen in regional business papers and magazines throughout the country? I won't reprint the bio here, but I am almost positive this strip could have been syndicated to Catholic newsletters, church papers. magazines, et al. Thanks very much for all the research you did. Oddballs -- I ordered a copy of the book. We'll see if that sheds any light on the matter. Offline/Dude -- I found that same press release. Unfortunately it appears that Davy Associates is no more, though. They stopped advertising in E&P after 2005 and I tried the phone number, it's disconnected. Since there was a crossword puzzle offered I figured it might have catered to weekly papers, but no luck finding any that used their stuff. Perhaps some Davy alum will see this and come forward with some info. But keep reading below -- maybe Davy was online material only. Our Parish -- I assumed it was a church paper feature as well, and her bio seems to support that. I went ahead and ordered a copy of the reprint book, though, to see if it sheds any more light on the matter. Thanks for the bio link. On The Beat -- excellent links! I'd say that feature can be stricken as Stripper's Guide material based on that bio. Also note the Davy Associates link with the press release. If Gaspirtz is saying he has done exclusively online content since 2000, and he had a feature with Davy, ergo Davy was some sort of Internet only syndicate? Maybe we're done with Davy after all (for Stripper's Guide indexing that is). Again, thanks very much for all the research you did Ray. "Overheard At America's Lunch Counters" definitely existed and produced at least one collection (http://www.amazon.com/Overheard-at-Americas-Lunch-Counters/dp/0312029616). It ran in one of the Seattle alternative weeklies...either The Stranger or The Rocket, and may have been syndicated to a few other papers. She also co-wrote an issue of Joe Sacco's first series, YAHOO. I agree, "Lunch Counters" did indeed run in some alternative papers. We're looking for appearances in 'mainstream' papers. Alt-paper appearances don't qualify for listing in my index. Allan, I go through Google News. Open up newspaperarchive in a window and minimize. Open up Google News in a new window. Search for item. Use quotation marks. "Out of this World" "charles addams"
in the search box brought up the feature because Charles Addams was a selling point and his name was printed with the panel title. in the search box brings up a heck of a lot more hits, reducing the search to 1955 - 1955 reduces the search to almost 2,000 hits. The more unique the title, the more complete the information, the better. When you find a likely candidate click on the link and it will open because you have already opened newspaperarchive. Due to space limitations, I leave it to you to fine-tune the search methods. I'm confused (a semi-permanent state). Does Google News search the newspaperarchive database with its own search engine, or does it just send on the request to NA's search engine? In other words, do you get better/different results from Google? If that's the case then hosannas are in order because NA's search engine is horribly buggy. I also I hate the 'feature' of fuzzy searches (which would be useful IF I could turn it off when I don't want it). "Does Google News search the newspaperarchive database with its own search engine..."
Uhhh, you tell me Allan. I'm a 20th Century Man who's made it to the 21st Century. I'm still trying to figure out how they get those big tubes into a monitor that's only an inch or two deep. >I agree, "Lunch Counters" did >indeed run in some alternative >papers. We're looking for >appearances in 'mainstream' papers. >Alt-paper appearances don't qualify >for listing in my index. so how do you determine what's mainstream and what alternative? While there's some gray area between alternative papers and mainstream ones, I consider a paper to be 'alternative' if (1) it focuses specifically on a particular lifestyle or audience (i.e. sexual persuasion, religious persuasion etc. ), or (2) it does not cover general interest news to the extent of a 'mainstream' paper -- in other words if it focuses on entertainment, humor or what have you rather than reporting actual news. Some alt-papers give a nod to reporting news. Those free papers that are popping up in Washington, New York and Boston, for instance, do cover a news story or two in each issue, but pretty much just as a teaser to get people to pick them up. Inside is mostly restaurant, music and other entertainment stuff. Close to a real newspaper, but not quite there. Yes, I know there is plenty of room for argument on my definition. Oh, I know the line has to be drawn somewhere. and of course, it's going to be the weeklies that are the most problem. Is the village Voice mainstream or alternative? Each Village Other? etc etc -- (and this may mean you have to determine what news is.... grin ). The Voice is right in that gray area, I've been meaning for a long time to take a serious look at it to determine whether or not its something I should index. The Other I think more comfortably fits in the alt-paper column based on issues I've seen. By the way, the creator's alias for Our Parish is the last name -- O'Connell vs. Ahern. An update -- the Our Parish and Oddballs reprint books arrived in the mail. Unfortunately neither book discusses any specific papers running the features, so we're no further on these two. Here's another one to add to this list. It's a daily panel called "Our Ancestors" and it ran from 1961-1965. It was created and drawn by editorial cartoonist Richard Q. Yardley. The source for this is Yardley's obit from the NY Times. It's not a mystery strip, though. It ran in many papers and I've documented it thoroughly for the index. Oh Oswald is original from France, although Jean Léo was born in Belgium. In France the comic was called "Oscar" and appeared first in Le Parisien Libéré in 1947. In ran 20 years in dozens of newspapers. Hello, Allan----Well, now Jim Ivey has to share his WWII "naughty" comic strip with us, or I'm sure we'll always feel we've missed something!-----Cole Johnson.